Born in 1852, Irish inventor Louis Philip Brennan had contemplated the concept of a flying machine (helicopter) as early as 1884. However, the art and science of aeronautics was very much in its infancy, and there was much to be learned. Even if the knowledge had existed, there were no suitable power plants light enough and powerful enough to propel man aloft in any machine, much less in a helicopter. The Brennan Helicopter with its inventor Louis Brennan standing before it and engineer/pilot Robert Graham in the pilot’s seat. This early tethered test photo shows the machine before its fuselage was completed. 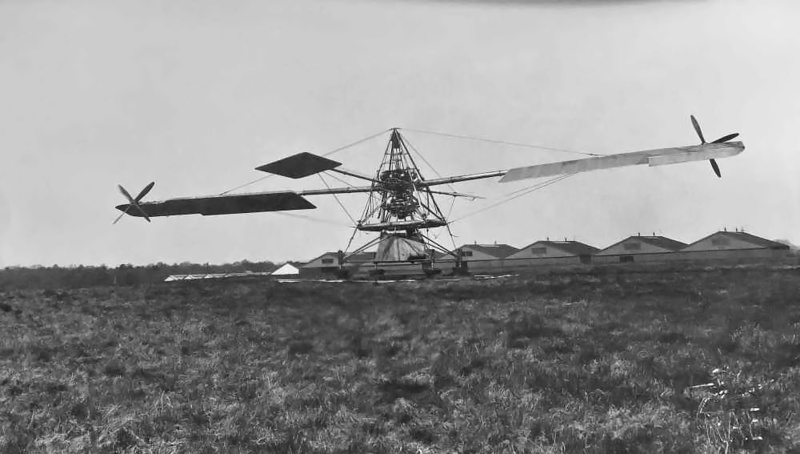 In the mid-1910s, technology began to catch up with Brennan’s idea for a helicopter, and the British Ministry of Munitions backed Brennan’s experimental helicopter project on 29 June 1916. Under strict secrecy, design work progressed slowly, and it was not until 1919 that construction actually began at the Royal Aircraft Establishment at Farnborough. The helicopter project was encouraged and supported by Winston Churchill, who transitioned from Minister of Munitions to Minister of Air at that time. Engineer Robert Graham joined Brennan’s team in 1920. The helicopter was constructed with a small fuselage (or pilot’s car) supported on the ground by four outrigger legs. The fuselage was equipped with a small rudder, and the fuel tank was under the pilot’s seat. Above the fuselage were the rotor blades and engine attached to a pyramid-shaped, steel supporting frame. The two wide chord rotor blades themselves were not powered; their rotation was achieved by a small four-blade propeller positioned at the tip of each rotor blade. This configuration provided virtually torqueless rotation of the rotor blades. The blades had a steel and wood frame and were covered in doped fabric. 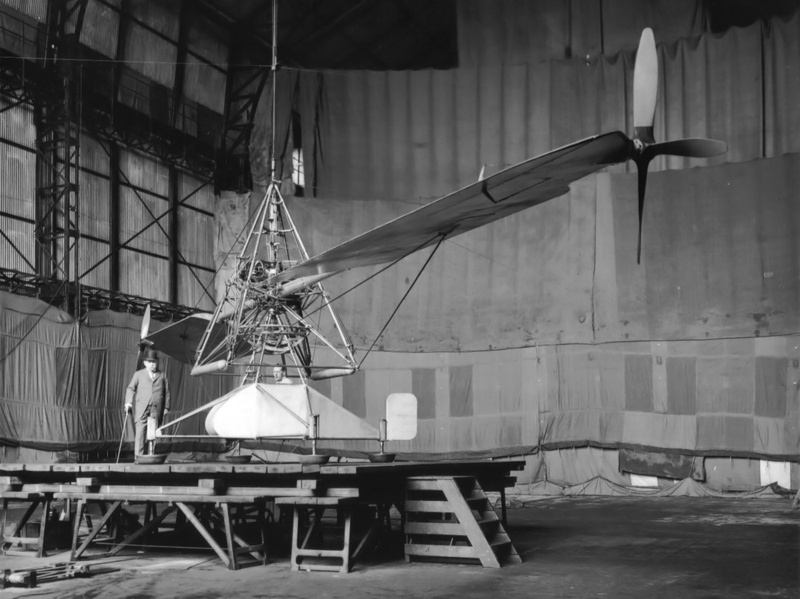 Each rotor blade was supported by a hollow tube (spar) through which the drive shaft ran to the tip propeller. The pilot could articulate the hollow tubes to change the incidence of the rotor blades. Each blade also had an aileron to further enhance the helicopter’s control. 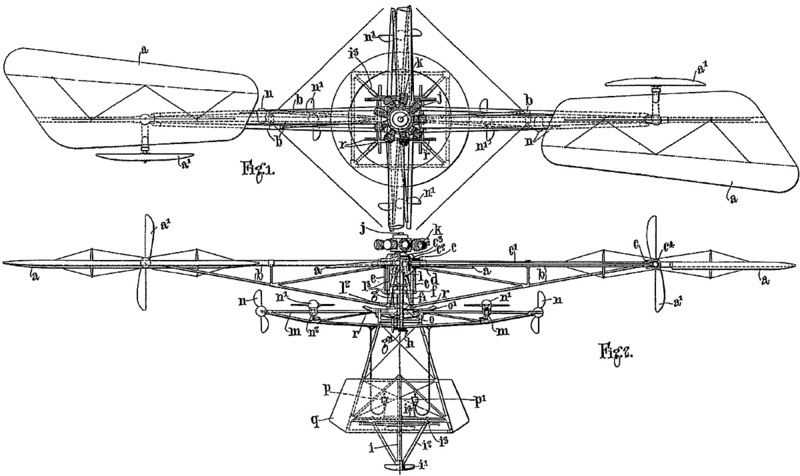 A drawing from Brennan’s “Improvements relating to Aerial Navigation” patent submitted in 1916. Note the small propellers (marked “n”) that were to be used for control. These propellers and their complicated drive systems were omitted from the actual helicopter. The controls were pneumatic, and the base cross tubes of the pyramid structure were enlarged to act as air reservoirs. Pressurized air was provided by an engine-driven compressor. The entire pyramid structure rotated when the helicopter was under power. The structure was attached to the fuselage via a universal joint. This joint was hollow, and flight controls and fuel lines passed through it. The tip propellers were geared to the engine via shafts and right angle gearboxes. Originally, a 150 hp (112 kW) Bentley BR 1 rotary engine was used, but a 230 hp (172 kW) Bentley BR 2 rotary engine was substituted because more power was needed. The nine-cylinder BR 2 engine had a 5.5 in (140 mm) bore and a 7.1 in (180 mm) stroke, resulting in a total displacement of 1,522 cu in (24.9 L). The rotary engine was positioned horizontally and revolved the same direction as the rotor blades (but faster). The helicopter blades had a 61 ft (18.6 m) diameter and a 6 ft (1.8 m) cord and rotated between 50 and 60 rpm. The total blade area was 240 sq ft (22.3 sq m). Brennan’s helicopter weighed 2,765 lb (1,254 kg). The Brennan Helicopter tethered in a hangar at Farnborough. Brennan is standing next to the machine with Graham occupying the cockpit. The fuselage has been completed and its rudder is visible. Note the cross braces of the pyramidal structure that acted as air reservoirs and the aileron on the rotor. The axillary rotors have not been added. 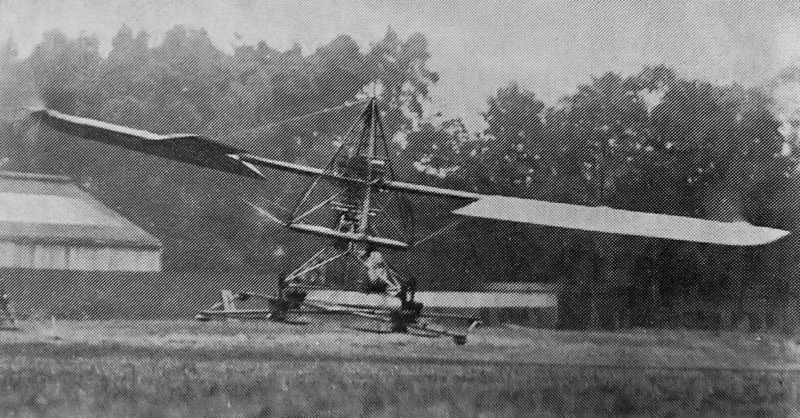 An attempt was made to begin Engine-powered spin tests of the rotor blades on 4 November 1921. The helicopter did not have its own starter at the time. A Hucks starter was used, engaging one of the tip propellers. The rotor blades were braced to prevent their movement. However, once the engine was started, the brace moved and was hit by a propeller. All testing stopped until the damage could be repaired. By 7 December, Brennan had designed and fitted his helicopter with a mechanical starter. The helicopter was rigged for tethered tests inside a balloon hangar at Farnborough. Brennan decided that since Graham had complete knowledge of the machine, he should be the one to fly it. The first tethered flight occurred on 22 December. Although the Air Ministry assigned pilots Paul “George” Bulman and Cecil Bouchier to the project, Graham made about 90% of the helicopter flights. Brennan’s helicopter ready for outside tests at Farnborough. Note the square-shaped auxiliary rotors. The tethered tests showed the helicopter to be underpowered, and it was at this time that the BR 2 engine was installed. With this engine, the helicopter could lift the pilot, four men, and an hour’s worth of fuel. However, the 60 ft (18.2 m) tall hangar provided a limited test environment, and the helicopter’s ascents did not top 20 ft (6.1 m). Stability tests, while still in the hangar, showed that directional control was not sufficient, and use of the ailerons hindered the helicopter’s control compared to blade articulation alone. A solution to the control deficiencies was to add additional rotor blades. Ideally, two full blades would have been added, but for simplicity, cost, weight, and speed of conversion, two small auxiliary blades were added. The auxiliary blades increased the lifting surface area by 60 sq ft (5.6 sq m), bringing the total to 300 sq ft (27.9 sq m). 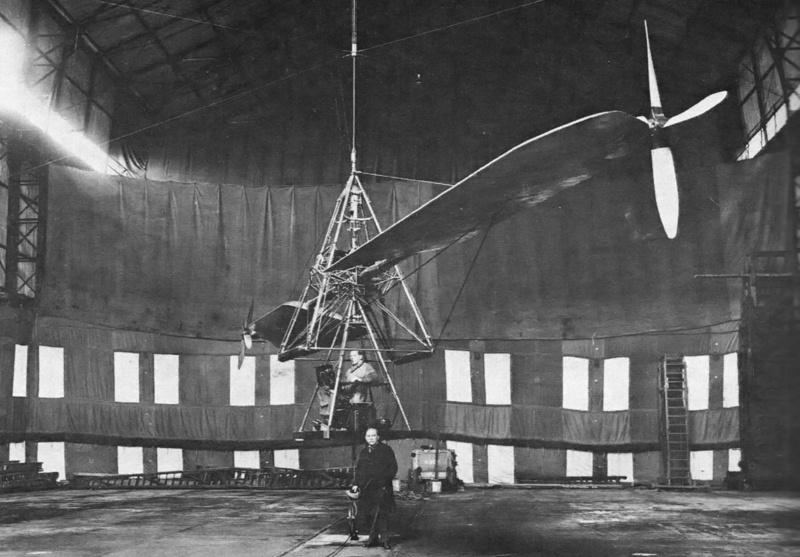 On 16 May 1924, the helicopter was tested out of the hangar for the first time. Initially, the helicopter was tethered, but free-flight tests commenced once confidence in the helicopter was gained. Since space was limited, the helicopter’s height was kept under 10 ft (3 m). A number of flights were made, some of which were flown by Brennan. Complete control was still a concern, and Brennan had designed a gyro to automate minor control adjustments and stabilize the helicopter. However, the Air Ministry wanted proof that unassisted control was achievable before any type of automatic control was added. It was estimated the helicopter could achieve a forward speed of 20 mph (32 km/h) and an altitude of 600 ft (183 m). The helicopter in low flight and perhaps lacking a little control. For all the flights, it was never flown higher than 10 ft (3 m). On 2 October 1925, the helicopter was being demonstrated before a number of officials when partial control was lost. Close to landing, the pyramid structure of the helicopter tilted and the blades struck the ground. While the blades were damaged, the propellers and gearboxes at their tips were destroyed. Although a definitive cause was not found, it was believed that contaminants had been introduced into the air system and caused a valve to malfunction. At this time, some in the Air Ministry felt there was no future for the helicopter and were not interested in continuing with Brennan’s experiment. Also, Juan de la Cierva’s Autogiro was showing some promise without all the complications of the helicopter. Subsequently, the decision was made to terminate the Brennan Helicopter project and investigate the Autogiro. Brennan was notified of the decision on 29 January 1926. He felt that cancelling the work on his helicopter was a mistake and that the Autogiro would never do everything a helicopter could. Brennan predicted helicopters would eventually provide unparalleled service to the world. Even though most components were undamaged, Brennan’s helicopter was never repaired. 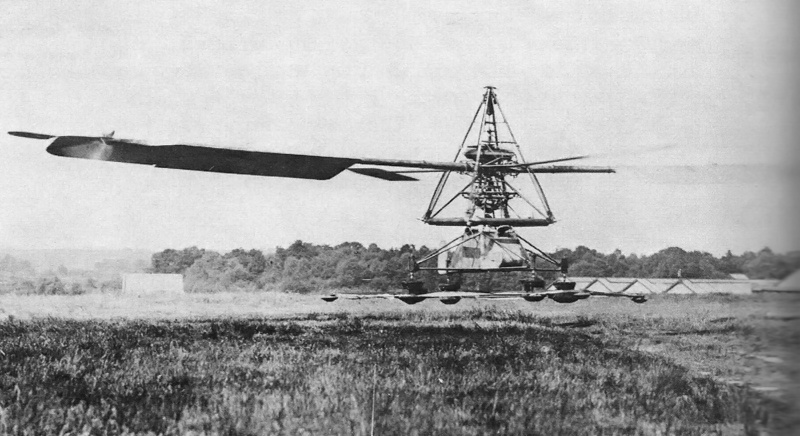 Louis Brennan died in 1932, about five years before other pioneers began to demonstrate the unique abilities of the helicopter. The Brennan Helicopter made over 70 free flights, and it was the first helicopter to fly in the United Kingdom. A good photo of the Brennan Helicopter in steady flight. Note that the aileron is at a slightly different angle than that of the rotor blade. This entry was posted in Rotorcraft on 8 January 2015 by William Pearce.